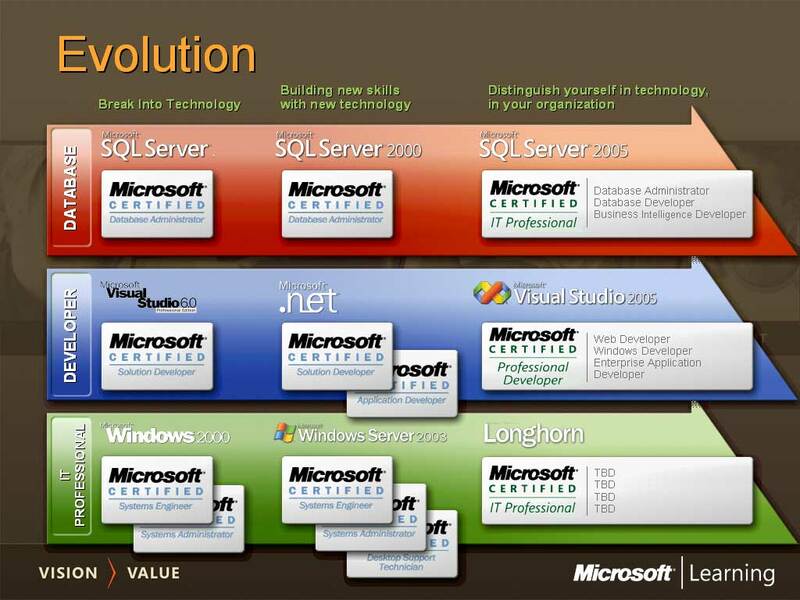 Framework for "new generation" certifications to debut in September, beginning with SQL Server, Visual Studio. 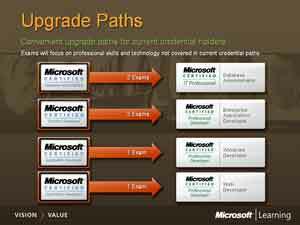 (Minneapolis, Minn.) Changes are afoot in the Microsoft Certification Program that can be labeled as "evolutionary"; that is, changes to the certification process will be implemented over time, as newer technologies become generally available. The first of those changes will occur among the SQL Server and Visual Studio products, which are planned for a major launch event in San Francisco on Nov. 7. Certification details for those programs will be posted around September on the Microsoft Certification Program Web site, according to Al Valvano, Microsoft Learning Group Program Manager. Valvano provided details of the revamped certification program plans during a Learning Solutions Workshop at the Worldwide Partner Conference in Minneapolis over the weekend. Tier 1: Microsoft Certified Technology Specialist will require simply passing one to three exams based on a Microsoft technology. As products meet the end of the support lifecycle, its related exam will be retired. Tier 2: Microsoft Certified IT Professional or Professional Developer require a Technology Specialist certification, plus one to three more exams, based on the requirement for a particular path. This tier is tied to job role at an organization, such as Database Developer or Business Intelligence. Recertification will be required to maintain status at this level. Tier 3: Microsoft Certified Architect is a rigorous, board-level certification that requires recertification. Achieving Technology Specialist or IT Professional or Professional Developer certification not a prerequisite to attaining this level of certification. Microsoft is still hammering away at the details for the first two tiers, but Valvano provided a generous amount of what the group has developed thus far, via a presentation that diagrammed the new framework. It's obvious that the new program differs significantly from the current program. "We're prepared only to provide details on the SQL Server and Visual Studio programs," he reiterated. Valvano explains that the "new generation" program is aimed at making it easier to identify the specific skills that an individual is capable of deploying (highlighted by the Technology Specialist) and the type of job role that individual can fulfill (IT Professional or Professional Developer). The new-gen certification will be composed of a credential and skill-identifying certification (see Figure 1). 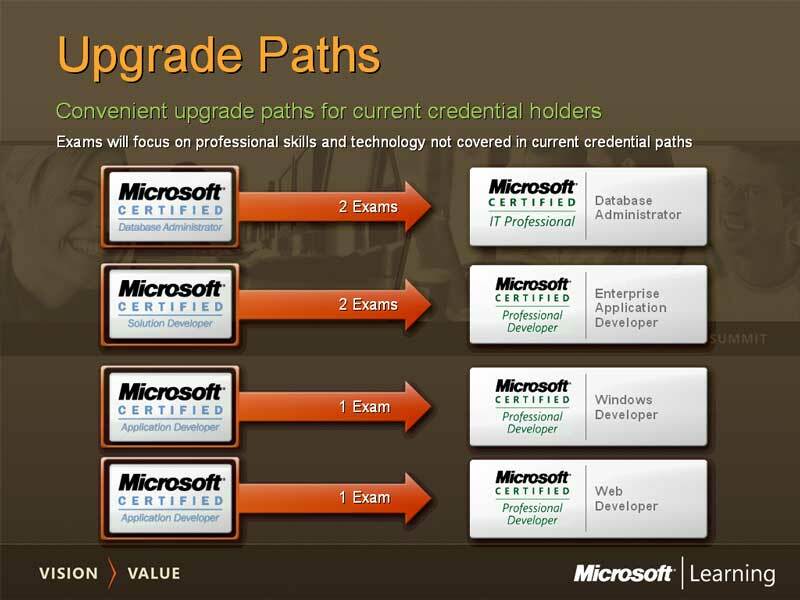 So, at the first tier in the new plan, a cert candidate might achieve several versions of Microsoft Certified Technology Specialist to highlight as many skills as possible. The skills will be listed to the right of the Technology Specialist logo. 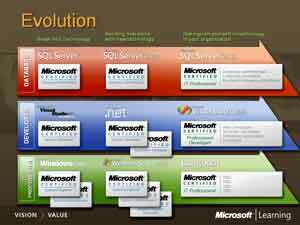 Some time in December, Microsoft hopes to be able to offer the initial Technology Specialist titles for SQL Server 2005 and Visual Studio 2005. Other technologies, such as BizTalk Server 2006 (next in line) and Longhorn (much further away, in late 2006) will go online when those products are eventually released. At the next tier is the Professional Series, either the IT Professional and Professional Developer. These titles will also require an extra set of one to three exams. The Microsoft Certified IT Professional is the likely title to make a comparison to the current MCSE program, but the difference is apples to oranges. The goal here is to provide a title that defines the individual's job role within an organization. Valvano provided an example for SQL Server 2005, which showed certifications for three specific job roles that a SQL Server expert might perform: Database Administrator, Database Developer, or Business Intelligence Developer. Even with the roles being distinct ones, a candidate can conceivably opt to attain all three. Microsoft currently has plans to provide an upgrade path for current MCDBAs on SQL Server 2003 to Microsoft Certified IT Professional: Database Administrator. Valvano says the path will consist of passage of two exams (see Figure 2). The Professional Developer credential is similar in some ways to its predecessor MCSD title, except that candidates can distinguish between Web-enabled or Windows-enabled development paths. And the Professional Developer Series does one better than the MCSD, by offering an additional Enterprise Application Developer job role. So, What Happens with My MCSE? Candidates working toward an MCSE or MCSA title might be wondering if their current certification efforts will become useless. Will the current title retire? Should candidates drop everything and wait for Microsoft to introduce the Longhorn version of the certification under the new program framework? "[The MCSE/MCSA/MCDBA titles] are not going away and those continue to remain valid, just like there are people who continue to certify on Windows 2000," says Valvano. He does acknowledge that there will be an upgrade path to the new certification program from the current ones (see Figure 3), but says that development on the preliminary framework hasn't even begun, as much depends on what's in Longhorn. And Longhorn is still more than a year from delivery.